As it is with so much else in Wilmington, the city’s parks can be divided into the Haves and the Have Nots. On the one hand, the beautiful parks along the Brandywine River are regarded as pillars of our shared cultural heritage and are maintained through a generous combination of state, local and private dollars. These are the Wilmington State Parks. On the other hand, there is an entirely separate system comprising dozens of other parks and open spaces that have fallen into disrepair, symbols of the unsustainable income inequality that has come to define this violent city. Too many neglected parks are in dire need of capital improvement projects. However, one park in particular is both foundational to our shared cultural heritage and representative of the ways in which open spaces improve quality of life. This is the story of Tilton Park. The official history of Wilmington’s parks begins in 1883, when a state-appointed board of commissioners recommended purchasing land along the Brandywine River for what would become Rockford Park and Brandywine River Park. However, this official history is misleading. These parks are not the oldest in Wilmington. That distinction belongs to Tilton Park. 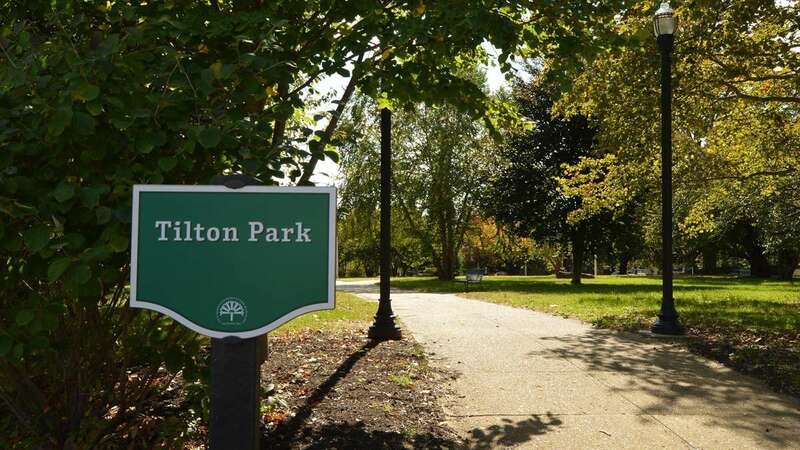 According to documents submitted to the National Register of Historic Places (NRHP), a public referendum approved in July 1865 established Tilton Park as the first city-funded open space in Wilmington. As this 1868 map shows, the Public Square (as they called it) was located just a few blocks outside of the urban center in an area informally known as Federal Hill, so named because Dr. James Tilton lobbied the Continental Congress to locate the nation’s capital in Wilmington. Just a couple-hundred feet from the northwest corner of the park, Dr. Tilton retired on a plot of land where now sits the University and Whist Club. Most of the homes currently surrounding the park were built by the late 1890s. Since then, Tilton Park has been a shared public space for many diverse communities. 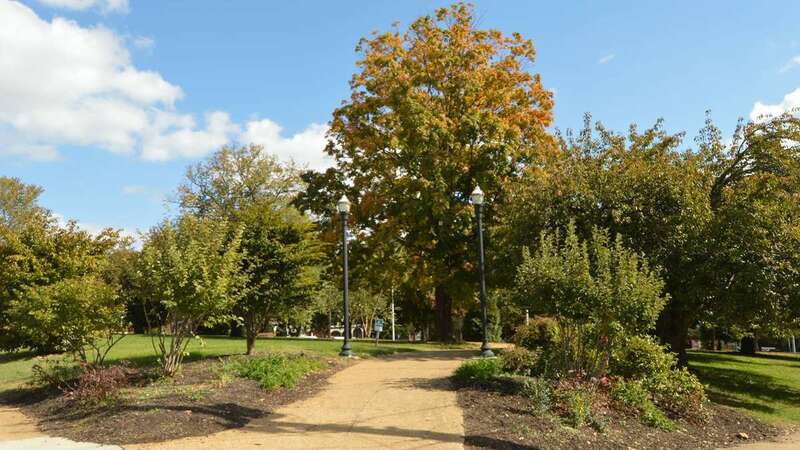 The park sits at the intersection of the Little Italy, Hilltop and Cool Spring neighborhoods and is near churches, mosques and community centers that serve diverse communities of various religious persuasions and cultural heritages. In this densely populated area of Wilmington, Tilton Park is more than just an open space; it is an urban oasis. When the winter snows thaw, hundreds of purple crocuses emerge across the meadow. A dozen ancient cherry blossoms bloom every April in a spectacular array of soft, rosy petals that soon blanket the ground, transforming this small corner of Wilmington into an Ozian dreamscape. The terrain gradually slopes downward, and the low shady canopy of the cherry blossoms gives way to towering sugar maples. 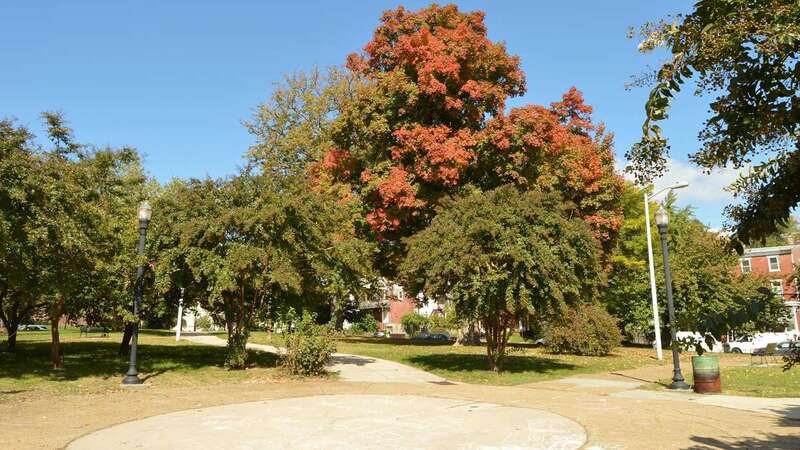 Twin paths cut diagonally through the park, intersecting at an abandoned brick pavilion and a half-dozen flowering crepe myrtles. Approaching Franklin Street, the ground dips into a broad shelf where a faded purple and teal playground beckons for the attention of rambunctious children. Throughout the summer, the park becomes the neighborhood’s front yard, bustling with activity as the sounds of the city echo off the brick facades of duplexes and apartment buildings. As summer changes to fall, the sugar maples burst into bright and dark shades of red. Walking through the park, as the chilly autumn winds scatter leaves across the landscape, I cannot believe that this oasis exists in the middle of Wilmington. Walking through the park is like traveling through time. Various textures of sidewalk, like layers of history and geological formations, betray an unspoken policy of lackluster and incremental fixes. Some benches are new, but many pre-date the computer age. The city replaced three trash receptacles but left one old hobo oil drum that appears to have been set on fire on more than one occasion. After June 1, the aesthetic is further augmented by two portable toilets which, from time to time, are found lying on their sides. The brick pavilion in the center of the park, which formerly housed public bathrooms, has long been closed to the public and the whole structure is slowly returning to the earth. The playground regularly floods for days at a time. And if the past is any indication, the city’s interest doesn’t extend beyond partially fixing the flooding and occasionally repairing the aging playground with parts that don’t match. Only a few years ago most of the streetlights didn’t work, that is, until the Friends of Tilton Park offered the commonsense suggestion that lights may deter open-air drug deals. With working lights, safety around the park improved. Some will mention that the city has recently invested in capital improvement projects for Tilton Park, such as the Tilton Park Mural. The only problem is that Tilton Park didn’t need a mural. Tilton Park needs new street lamps and benches. It needs the trees pruned and sidewalks patched. It needs visible crosswalks and traffic calming. The Department of Parks and Recreation is doing all it can with its skeleton crew. But cutting the grass is not enough. Residents around the park work collectively to improve safety and infrastructure, and only in the past few years has anything improved dramatically. Most days, residents pick up the litter that blows out of the too-few, overfilled trash cans. One resident painstakingly pulled the weeds growing up through the cracks in the sidewalks. 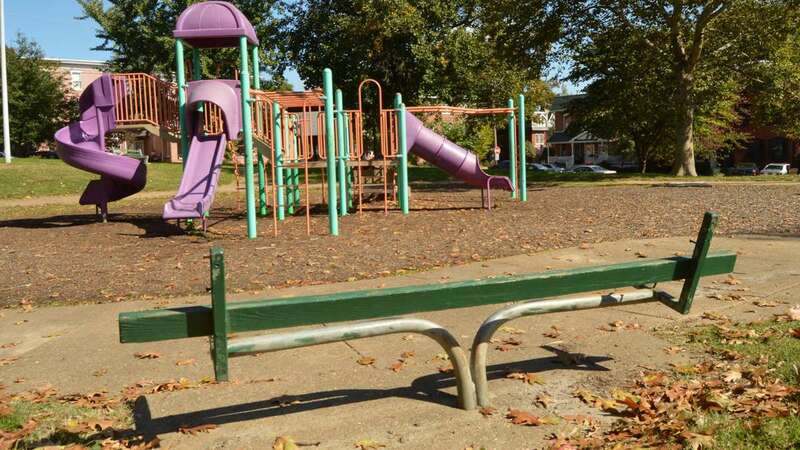 Last year, the neighborhood purchased new wooden planks for the benches and partnered with Parks and Recreation to uproot overgrown shrubs that gave cover to drug deals. The Friends of Tilton Park have also partnered with the Delaware Center for Horticulture to improve the gardens along the corners – chopping down weeds that had grown to about nine feet tall on one of the hottest days of July. For two years, the neighborhood has hosted an annual Police Appreciation Cookout to let our law enforcement officers know that the residents around the park are committed to improving public safety. The citizens of Tilton Park go above and beyond what is required of any private citizen to ensure that a public space is clean and safe. 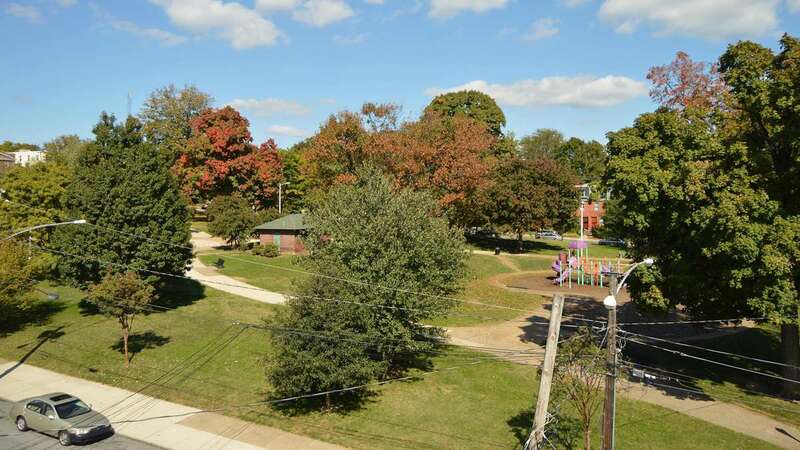 In a city beset by gun violence, Tilton Park is an example of how a well-maintained open space can improve the quality of life and build communities. It is no less worthy of preservation than the parks along the Brandywine. Living in a city recently named “Murdertown USA,” it seems petty to complain about the parks. And maybe it’s unrealistic to expect the city to redirect valuable public resources to fund improvements for a small public square. However, the state of a city park is a direct reflection of the socioeconomic standing of the neighborhood it is in. There is no justification for investing millions of tax dollars for capital improvements at three parks in the wealthiest areas of the city while others fall into disrepair. Maybe membership into the Wilmington State Parks could be less exclusive. Maybe Tilton Park could be absorbed into the Wilmington State Parks system along with several other open urban spaces. Or maybe we need to rethink the way the city funds and maintains its parks. No more temporary fixes. We need real, permanent, sustainable change. Well-maintained parks improve the quality of life. This is the way to a better Wilmington. Jordan Howell works in the English Department at the University of Delaware and is also a resident of Tiltlandia. His opinions are his own.